With the jobless rate expected to remain high, professional investors are turning to other sources for better readings on the economy. BOSTON ( TheStreet) -- The U.S. government said today that the unemployment rate unexpectedly rose to 9.2% in June, sparking a selloff in equities and unleashing more anger and disappointment from both Wall Street and Main Street. The jobless rate has become the most important barometer for the health of the economy, which dictates the direction of stock prices and bond yields. But some investors pay scant attention. Instead, they turn to little-known reports including the ISI Trucking Survey and the Association of American Railroads' traffic figures because they tap the pulse of the economy better. The Labor Department said the U.S. economy added a mere 18,000 jobs in June, well below economists' average target of 100,000. A downward revision to May's employment data and a higher unemployment rate last month once again heightened worries of a slowing economy. The Dow Jones Industrial Average was recently down 132 points, while the yield on the 10-year Treasury dropped to 3.05% as prices spiked. The nonfarm-payrolls report is critical, especially with the political ramifications due to the lack of robust job creation. Still, its importance has been dulled. Weak reports on jobs and housing reports have stifled any yearning for optimism. With Europe's debt woes and natural catastrophes added to the mix, investors have been a dour bunch this year. "Jobs and housing, housing and jobs, jobs and housing. Oh, and Europe," laments Kent Croft, manager of the $420 million Croft Value Fund ( CLVFX. "We all know it's a tough road for a while and that we're going to have to muddle through. And with numbers, you can interpret them in different ways and politically they can be spun different ways to meet your needs." Using economic data isn't standard operating procedure for a bottoms-up researcher like Croft, who instead prefers to focus his strategy on the merits of individual companies to find true value. But Croft says that when he wants to get the pulse on economic activity, he simply dials up a transportation analyst. "That gives me an idea of what they're seeing on the ground first," Croft says. "And they tell me they don't understand why people don't call them first!" Croft says he turns to analyses from transportation experts when there is a lot of negative press raining down. Two particular reports that give him strong indications of economic activity are the weekly railroad traffic report from the Association of American Railroads and the monthly truck tonnage report from the American Trucking Association. "These are the type of numbers where the rubber meets the road, literally, so you can see what's going on at that level," Croft says. "This is data that is easy enough to get. And it's very detailed, too." So what are the data telling Croft? In its most recent weekly report, the Association of American Railroads posted mixed results for rail traffic. While U.S. railroads saw carloads fall 0.2% from the same time a year earlier, cumulative volume of carloads is up 2.8% from last year through the first 25 weeks of 2011. That doesn't match the doomsday scenario some economists are laying out. Jerry Jordan, manager of the $100 million Jordan Opportunity Fund ( JORDX, also turns to under-the-radar transportation data to find leading indicators on where the economy is headed. His top choice is the trucking survey by International Strategy & Investment, or ISI, an investment-research firm. "The trucking survey is particularly interesting," Jordan says. In a July 5 report, the survey showed that truckload and revenue readings were better for a fourth straight week. They are now at their highest level in five years, before the financial crisis took hold. "We've had a scenario where expectations got too high so numbers have come down, but the economy is still plugging away," Jordan says. "Things aren't as bad as people thought they were a week ago, just as they aren't as good as people thought they were in April." Jordan is also partial to reports from the Economic Cycle Research Institute, or ECRI, a favorite of James Dailey, portfolio manager with TEAM Financial Managers, a firm with $200 million in assets under management. Dailey argues that the nonfarm-payrolls report has so many inputs that pundits can shape the data to fit their preconceived biases. To stay objective and minimize data mining, he turns to the ECRI indices to avoid falling into the trap of modeling the economy like most economists do. ECRI produces several U.S.-related indices for professionals to follow, including the Weekly Leading Index, Future Inflation Gauge and Leading Home Price Index. Dailey says he pays closest attention to the Weekly Leading Index, which is released every Friday and offers him a disciplined approach. "When they see these indicators moving, as they are right now, they make a forecast," Dailey says. "We listen to what they say, and we think it's important." Dailey argues that the forecasts from the ECRI are spot on. Earlier this year, the research firm predicted that the global industrial cycle was going to experience a downturn starting this summer. "It wasn't a recessionary forecast but instead a decline in the growth rate," Dailey says. "But if you're growing at 8% and it goes down to 2%, it feels like a recession. That's a big move." And even though Wall Street researchers, economists and even Federal Reserve Chairman Ben Bernanke expect a ramp up in economic activity in the back half of the year, the ECRI data indicated there is no sign of a reacceleration of growth through 2011. "It's too early to tell whether this will be a new recession," Dailey says. "They're forecasting that it's not just a soft patch and that it won't last for only month or two. When the data come in weaker than expected in aggregate as we head toward September, this summer could see market action become much choppier." Based on those expectations, Dailey is turning to stocks like Annaly Capital ( NLY - Get Report) and Royal Gold ( RGLD - Get Report) for protection. Annaly Capital, which manages and finances a portfolio of real-estate-related investments, is a play on Dailey's expectations that the yield curve will remain steep as the central bank keeps rates anchored near zero. "There will be a nice spread there for companies like Annaly," Dailey says. "They borrow on the repo market on the front end of the curve, they buy mortgages, and then make the spread off that difference. They've been able to generate huge rates of return on their equity with relatively modest leverage." Royal Gold, meanwhile, is a conservative way for Dailey to play his expectations of a movement in gold prices. Royal Gold is a trust that collects royalties from mining companies after putting up their own capital. "The companies are still being valued as if gold is going to go back down," Dailey says of mining companies. "There is tremendous upside, and Royal Gold is a nice conservative way to play it because you get the royalty stream without the operating risk." Dailey doesn't completely dismiss the importance of the jobs data, noting that it offers a good read on the aggregate psyche of the investor based on the market reaction. "It's the old Wall Street saying that it's not the news, it's the reaction that's important," he says. The issue he has with the jobs report and other economic data is the unreliability due to frequent revisions to old numbers. "Most of these economic numbers are revised to all living hell for two years," Dailey says. "A little while ago, another 2 million jobs were magically lost during the recession. Oops! It's so ridiculous looking at the standard error rate. It's all noise and it's complete nonsense." Paul Nolte, director of investments with Hinsdale Associates in Chicago, says jobs-related reports still give him a strong sense of where the economy is going. "We're looking for trends," Nolte says. 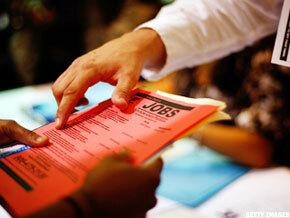 "We've flattened out in the jobs report, around 150,000 to 175,000 jobs. It's going to be important going forward looking at revisions and if we can get over that hump. " Because components of the jobs report -- namely income numbers and the time it takes to find employment -- are indicative of a very weak job market, Nolte says he has been defensive. Some of his top picks are Coca-Cola ( KO - Get Report), PepsiCo ( PEP - Get Report) and Walgreen ( WAG, all of which he said are inexpensive. Not be forgotten in the debate over the imporance of the jobs reports is key manufacturing data. Recently, economic releases on the Chicago Purchasing Managers Index and Institute for Supply Management have come in stronger than expected, which have helped the industrial holdings of Michael Sansoterra, a portfolio manager for RidgeWorth Investments, a firm with about $50 billion in total assets. Sansoterra says he has been slightly overweighting the industrial sector as he owns cyclical growth stocks. Two stocks that have rallied sharply over the past month have both been plans on a turn in data on aerospace. Sansoterra notes that airline companies have not been investing in their fleet for some time now. "They really cut back, parking a lot of planes in the desert," he says. "As their fleet utilization came down, the planes in the desert were used for parts to keep existing planes they were flying going." With no planes left in the desert to scrap for parts, Sansoterra expects a pickup in new plane purchases as airline companies also search for better fuel efficiency and better customer offerings like wireless Internet connectivity. To play this expectation, Sansoterra has invested in Precision Castparts ( PCP and BE Aerospace ( BEAV. "All the data points look like they're inflecting," Sansoterra says. "We're off of trough lows as demand is back. We've been waiting for this data to start presenting itself. Now we need planes to match it."